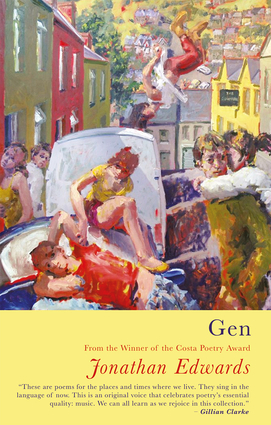 Gen is a book of lions and rock stars, day trips and servants, postmen and voices. In the opening sequence's exploration of youth and young manhood, the author sets his own Welsh Valleys upbringing against the '50s youth of his parents and the experience of a range of pop culture icons, including Kurt Cobain and Harry Houdini. These poems give way to a sequence of monologues from a range of voices, from an eighteenth century servant to a twenty-first century phone box. Other poems celebrate a Welsh Valleys village and the characters who live in it, and the collection concludes with a selection of sometimes witty, sometimes heartfelt, love poems. Jonathan Edwards's first collection, My Family and Other Superheroes, received the Costa Poetry Award and the Wales Book of the Year People's Choice Award. He has read his poems on BBC radio and television and recorded them for the Poetry Archive. He works as a teacher in South Wales.